With three seconds left in regulation and the Chicago Bulls down by one point in the final game of a best-of-five first-round NBA playoff series against the Cleveland Cavaliers, Michael Jordan fought to secure the inbounds pass, drove to the middle of the floor and threw up a double-clutch 18-footer over Cleveland’s Craig Ehlo. 2017 has quietly been the year of the Air Jordan IV. Jordan celebrated the game winner by leaping into the air while swinging his fist fiercely in celebration. When he returned to the hardwood, his landing was cushioned by a pair of “Black Cement” Air Jordan IVs. Released in 1989, the shoes were lighter and more breathable than their predecessor, the Air Jordan IIIs. Legendary designer Tinker Hatfield crafted the IVs with a lighter nubuck material instead of leather, and an upper body featuring mesh-filled cutouts that served as a ventilation system. That’s exactly what Jordan did in Game 5 against the Cavs in ’89 — the 28th anniversary of which is on Sunday. In a sense, it’ll be an anniversary for the IVs, too. And Nike and Jordan Brand are already ahead of the game, as 2017 has quietly been the year of the Air Jordan IV. On March 25, the Motorsport IVs were released to the public for the first time. The original 16 pairs of the white, black and royal shoe were presented to the members of Jordan’s motorcycle racing team in 2006. 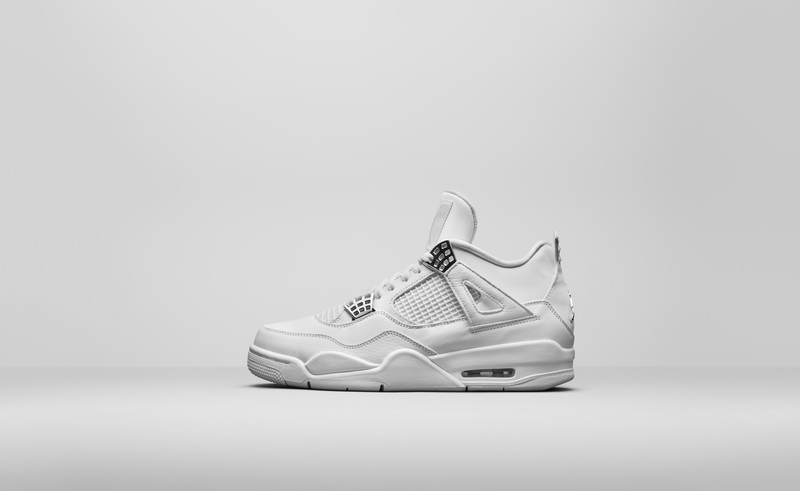 On June 17, the Alternate Motorsport IVs will drop, with black, not white, as the shoe’s primary color. The most beautiful shoes to come out this year are, without a doubt, the KAWS x Air Jordan IVs. The most beautiful shoes to come out this year are, without a doubt, the KAWS x Air Jordan IVs. Jordan Brand collaborated with Brooklyn, New York, artist KAWS to design the smoothly styled, gray suede shoes, which feature a glow-in-the-dark outsole. At retail, the KAWS IVs cost $350. And if you failed to cop a pair when they were released in late March, they’ll cost a pretty penny, with a resale value upward of $1,500. 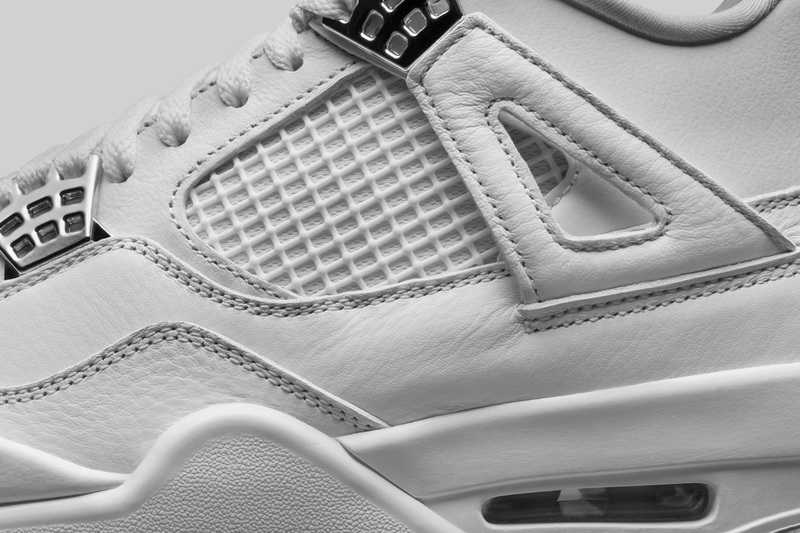 The Pure Money IVs will be released May 13. They’re also the simplest: an all-white colorway accented with platinum eyelets. When you think of all-white kicks that are essential every time summer rolls around, the pairs that come to mind nowadays are the triple-white Nike Huaraches, the cream-white Adidas Yeezy Boost 350 V2s and even the “Damn Daniel! Back at it again with white Vans.” But this summer, don’t sleep on a crisp pair of all-white IVs. The Pure Moneys are pleasantly practical. The Motorsports have the best backstory. And the KAWS come together to form a masterpiece. But as we appreciate the different pairs of IVs that have surfaced in 2017, we can’t wait for the Black Cements to make a return. There are rumors they could drop this year. But what about a 2019 release? That way we could all celebrate the 30th anniversary of “The Shot” in style.